The “sharing economy” is today’s buzzword for Silicon Valley’s most recent batch of billion dollar companies. So ring the headlines: $51 billion valuation for Uber; Chinese ride-hailing business Didi Kuaidi raising $4.42 billion; AirBnB valuation $10+ billion. In the last three years, the world has embraced this idea of the sharing economy. Who would have thought that a twenty-three year-old part-time student tooling around in her Prius would disrupt the transportation industry? Or that renting out your spare bedroom with the Star Wars sheets could make you part of the largest hotel network in the world? Is it just us or is there something a bit awkward about marrying ‘sharing’ with ‘billion dollars’? Unless you are sharing a billion dollars, which would be rather cool. In reality it’s millions of people ‘sharing’ to produce a handful of billionaires. Riddled with contradiction, it brings to mind a pseudo-communist dictatorship with a well groomed leader. The word ‘share’ comes from the Old English word ‘scearu’, related to sceran ‘to cut,’ and is recorded in the late sixteenth century to have meant, “to divide one’s own and give part to others.” Note the word ‘give’ in there. The latin origin for ‘give’ is ‘muni’ and finds itself in words such as communication and community: we share our words; we share in communities. 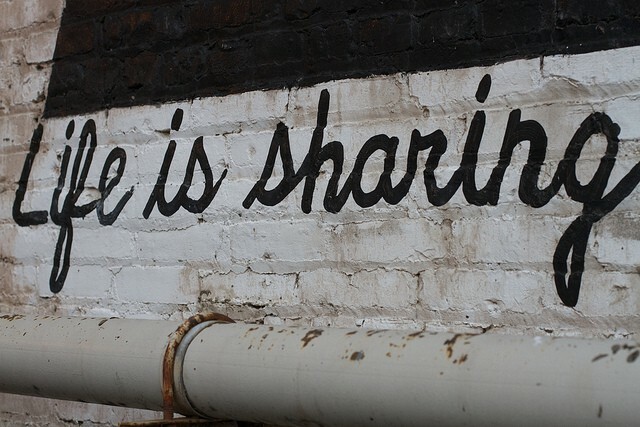 Sharing has been an important part of humanity’s mutual ability to distribute resources and sustain relationships, since the time of fire and caves. We share with our families, we share with our friends, and in some places we still share with our neighbours. Sharing creates community, social cohesion and the identity of the group. Real sharing thus finds itself in the remit of giving and was never a transactional endeavor. Sharing doesn’t therefore seem to be the most fitting description for technical platforms that enable users to pay to use one another’s underutilized resources, be it homes or cars. “Rent” might be a better word. “Rent” in the mid-15th century meant, “to rent out property, grant possession and enjoyment of in exchange for a consideration paid.” Whilst modern rental platforms offer enormous value, enabling trust between strangers and a partial deconstruction of hierarchical economies to the peer-to-peer level (albeit with the same macro ownership structures), they do not reflect the sentiment of sharing that has defined communities as communities for thousands of years. Is it just semantics? Does the distinction really matter? Well yes. We believe so. And not because we are not fans of rental platforms — we are — but in the miasma of lumping everything together as the “sharing economy” we are threatening to distort and confuse both the meaning of sharing, and the very real and silent sharing economy that sits like a backdrop to our reality. So what is the real sharing economy? It includes libraries and buses, roads and parks, power systems and water supplies, courts and rummage sales, charity shops and bulletin boards, community gardens and universities. This isn’t just about mobile apps. We estimate the entire sharing economy represents well over $15 trillion of assets. To put things in perspective, the headline grabbing venture-backed “sharing economy” is worth about $130 billion. That’s less than 1% of the broader sharing economy. To allow the “sharing economy” to be understood as Uber and AirBnB, would be to understand the “music economy” to be Taylor Swift and Adele. Perhaps the term “sharing economy” is self-consciously contradictory. The definition of economy is “the state of a country or region in terms of the production and consumption of goods and services and the supply of money.” So we are explicitly making sharing transactional; turning it into a market. Let’s consider then the even broader culture of sharing: thanksgiving lunches, helping a friend move house, Christmas gifts and giving a stranger directions. The U.K. government reckons that the informal gift economy is in fact bigger than GDP. Technology allows us to safely and efficiently share outside our trusted friends and family. There has been a well-spring of apps and platforms to better enable sharing between strangers. Both of us were attracted to the idea of building startups that encouraged genuine sharing. Using technology to enable better distribution of resources spoke to our aspiration of addressing planetary challenges at scale and speed. Reddit, CouchSurfing,Kiva, IndieGoGo, Etsy, Waze, Mozilla, and Wikipedia all represent the type of scaled community power that could be applied to the sharing of our time and our things. Respectively, we built Impossible and Yerdle to further these goals. There’s a lot at stake. By the end of the century, the earth will be home to 10 billion people. It can’t accommodate us all if we all consume resources like the Americans or British of today. We would need three planet Earths to support us. We’ll jointly use what we have, or we’ll die fighting each other for the last bits of water, atmosphere, phosphorous, and arable land. Jointly using what we have, sharing, is one of our best chances for survival. There is a massive opportunity for people who wish to serve the planet to take hold of new technological tools and out-invent those who would consume our common assets. We invite you to join us in rewiring the economy so that everyone can benefit from the bounty of the earth. We have trillions of dollars of underutilized resources that need to be unlocked. The challenge of our generation is to get more out of every tomato, drill, mile of road, and hour of boredom. That’s the only way we’ll stretch our resources across 10 billion people. And developing systems that foster cooperation and mutual benefit is fundamental. The benefits belong to all of us. This article was co-written by Lily Cole and Adam Werbach, and published on Medium in March 2016.